When a product becomes the soul of a land! The Nebrodi Black Pig Italian Cured Ham is the soul of our territory. Pleasant as needed, but not too salted. Intense and spiced! Each slice carries the Nebrodi world, our world. You should consider that each Nebrodi Black Pig thigh stands different hardly controlled phases (salting, drying, covering with sugna- pork fat). Each phase is realised under the vigilant eye of our pork-butchers. Our laboratories were projected to recreate ancient seasoning places: natural and good aired rooms. I’ll tell you more: it is the Italian ‘pata negra’! Do you think I’m exaggerating? No, I’m not… because these two products have the same genetic at the base. Also Prince Carl of Great Britain esteems it. Did you know that in England he sponsors the Rare Breeds Survival Trust? What an intuitive person the Prince! And we are intuitive too, because everyday we make the world know our excellence product. 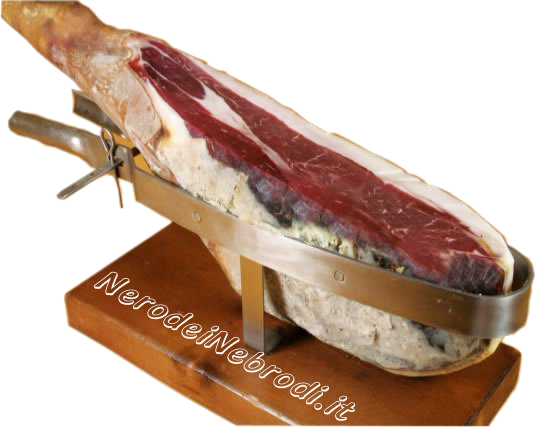 Here it is another prestige element: the Nebrodi black Pig Raw Ham is a SLOW FOOD praesidium. Its uniqueness is given also by the seasoning from 20 to 24 months. Its consistence and its aromatic notes makes it the main course of each dining table, from the appetisers to second courses passing through the first courses. It is sublime when you couple it with dried fruit and it is also tasty with eaten with stuffed roll of chicken. What about the slicing? The best is when you slice it with a knife, but to help you we can bone and we can divide it in slices. In this way your only worry is to verify its taste. Trivia: It is produced exclusively from the meat of black pigs bred in the Nebrodi Mountains. This native breed falls into one of 144 principals of Slow Food and is inserted in the archive of Quality Products from the Italian Coldiretti (Italian Farmers Association). Every ham has a certificate of traceability.